In 1980, when Howard Zinn's seminal work of non-fiction, A People's History of the United States (Harper & Row, HarperCollins) was published, it was intended to be different from the traditional "fundamental nationalist glorification of country." Reviewing it in the New York Times, ("Majority Report; Majority Authors' Queries", 2 Mar 1980) Eric Foner said Zinn's work presented the "...less dramatic but more typical lives — people struggling to survive with dignity in difficult circumstances — receive little attention." Zinn's main goal was to show how classism, sexism, and racism have historically created oppressive conditions for ethnic minorities, women, workers, homosexuals, and immigrants through their own voices and stories. With this collection the co-editors, Victor LaValle and John Joseph Adams, have aimed to do something similar. However, while these 25 stories are also about marginalized people, they depict fictional futures derived from the socio-political problems of the United States today; more specifically, the conflicts that have been boiling over during the Trump presidency. ... this book is inspired by the countless generations of offspring who lost the right to forge futures of their own making. Zinn had already written about our past, so my co-editor, John Joseph Adams, and I decided to ask a gang of incredible writers to imagine the years, decades, even the centuries, to come. And to have tales told by those, and/or about those, who history often sees fit to forget. Together, these futures show aspects of dystopia and utopia, oppression and resistance, despair and hope, fight and flight, fragility and resilience, enemies external and internal, personal struggled and social movements — in short, all the mess and the magic that has always made up human existence. Mostly, they show us what we, the people of the United States, could become if we continue down certain extreme and damaging trajectories. At the same time, they also make us question who we are as a people today and how we're responsible for such possible futures. A diverse (in terms of race, gender, sexuality, ethnicity) and talented group of emerging and established writers has been assembled here, including N. K. Jemisin, Omar El Akkad, Lesley Nneka Arimah and Daniel José Older. Although every story doesn't land with the same impact, each one challenges our notions of the often-idealized American past, present, and future. No matter what the struggle or hardship, almost every character resists in his or her own way. Several stories share certain world-building tropes (e.g., robots, fictional/alien creatures, time travel, artificial intelligence, biohacking, etc.) and themes (e.g., gender fluidity, California set apart both ideologically and geographically from the rest of the United States, literary censorship, state-controlled reproductive rights, and more), giving the anthology more coherence and synergy. Some of the most striking stories involve border control as their key plot points: Charlie Jane Anders' "The Bookstore At the End of America"; Lizz Huerta's "The Wall"; and Justina Ireland's "Calendar Girls". There are some stories where the writers seem to have pulled their punches and missed important opportunities to push readers further out of our comfort zones. Alice Sola Kim's "Now Wait for This Week" and Hugh Howey's "No Algorithms in the World" are two of a few such stories that, given their individual premises, could have been edgier while staying true to their near-future projections. Speculative futures are mostly extended metaphors for psychological and political realities that already exist. However, they need to go beyond merely reflecting the fears peddled by news and social media on a near-daily basis. Such stories also ought to do more than provide escapist, extrapolative thought experimentation. They should make us ponder, question, and debate our humanity, values, illusions, taboos, and technologies. They should make us realize how much our behaviors and actions today can have far-reaching consequences for future generations. It is fair to say that each story here rises well to the latter challenge. 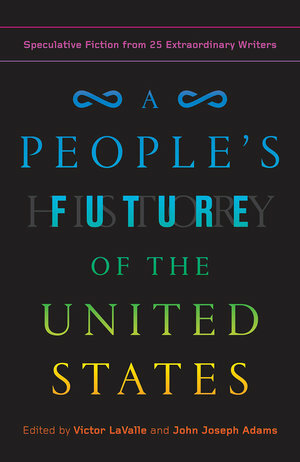 Given the wide range of themes and narrative styles, A People's Future of the United States is clearly aimed at and should appeal to more than the usual fans of speculative or science fiction. Regardless of where a reader stands with their own projections of where we're all headed, they will likely agree with the resounding notion here that our world will get worse before we can make it through to the other side. So, as the characters demonstrate in many ways here, we must resist, persist, and never give up hoping and working for that better future for everyone. This has always been our individual and collective responsibility, irrespective of our tribal affiliations and loyalties.